Pillar to Post: WORLD ARCHITECTURE / HOW GOES THE JEDDAH TOWER? As of July 2017, the Jeddah Tower skyscraper in Saudi Arabia has reached the 59th floor and is expected to be completed in 2019. Total floors when finished will be 167 (estimated) and will reach an (estimated) height of 3,300 feet. Designed by American architect Adrian Smith, who also designed Burj Khalifa and the creator and leader of the project is Saudi Arabian Prince Al-Waleed bin Talal, the wealthiest man in the Middle East, a grandson of Ibn Saud, and nephew of the Kings of Saudi Arabia before him. Al-Waleed is the chairman of Kingdom Holding Company (KHC), which is a partner in the Jeddah Economic Company (JEC), which was formed in 2009 for the development of Jeddah Tower and adjacent city. 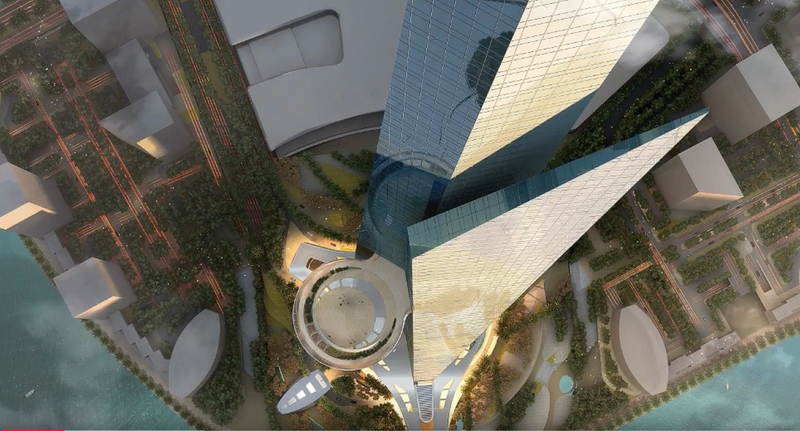 Total complex (tower and city) will be completed in 2024.